Welcome to the Cantareira desert. 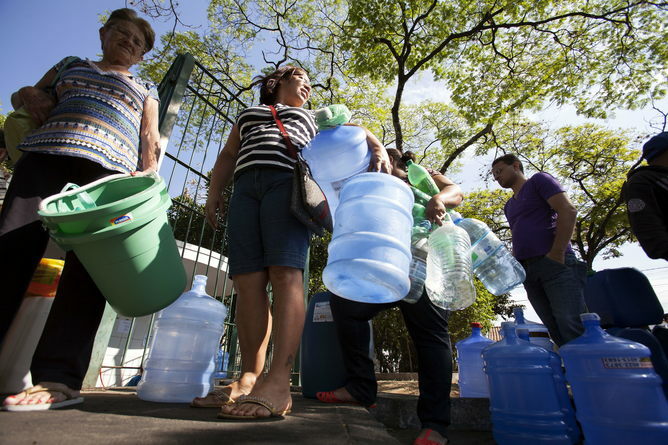 São Paulo’s ongoing water crisis has left many of the city’s 20m or more residents without tap water for days on end. 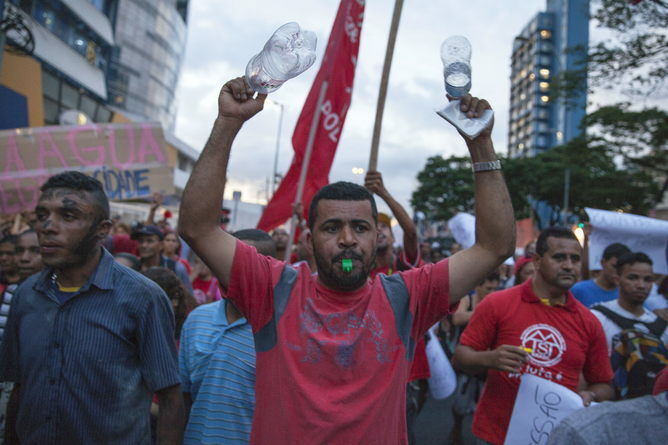 Brazil’s largest metropolis is into its third month of water rationing, and some citizens have even taken to drilling through their basements to reach groundwater. Most commentators agree that the crisis is to blame on multiple factors, but few have questioned the role of the water company in charge: Sabesp. The utility, responsible for water and waste in São Paulo and the surrounding state of the same name, has clearly failed its public service remit. Yet, it’s not even clear whether public service is the highest priority for part-privatised Sabesp, whose directors have just awarded themselves bumper bonuses despite millions of their customers going thirsty. 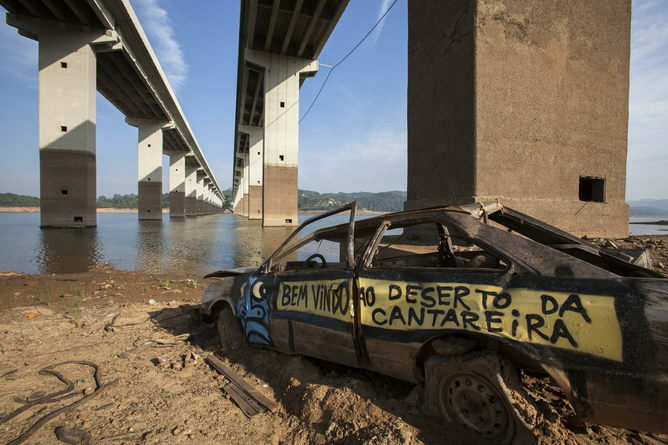 São Paulo’s water will go from crisis to crisis so long as Sabesp prioritises profits over long-term investment. Clearly there are human-induced environmental factors at play: climate change, deforestation of the Amazon, pollution, as well as overconsumption. The pressures we put on nature are likely to increase water shortages worldwide, perhaps leading to conflicts and wars. However, at the same time, there have always been droughts. Historical records going back hundreds of years show how cities and regions have struggled and often coped with extreme water shortages. So, periods without much rain are nothing new. But if that is the case, shouldn’t it be the responsibility of water utilities to plan for such events, putting in place contingency measures to manage possible water shortages? The only way many people can get hold of fresh water. São Paulo’s extraordinary growth in recent decades has overloaded the Cantareira, the city’s water supply system. But the rapid increase in water usage was hardly a surprise; it’s something that could have been managed and planned for. Sabesp has failed to do exactly that. One of the world’s largest water utilities, Sabesp was founded as a public institution in 1973. Since part-privatisation in 1994 the state of São Paulo has maintained at least half of the company’s voting capital, though shares are also traded on the New York and São Paulo stock exchanges. While The Economist and others were keen to point out that Sabesp is “majority-owned by the state government”, this doesn’t tell the whole story. The utility is neither a public organisation concerned with providing a public service, nor a private company facing competition from other companies and controlled by regulatory agencies. Just like the “natural monopolies” enjoyed by water companies in the UK, Sabesp has a publicly guaranteed monopoly, yet its profits are part-privatised – earlier this year it paid out R$252m (US$83m) in dividends. Water rations aren’t very popular. São Paulo’s water is just one of many public utilities that have been privatised throughout the world over the past few decades. Governments have followed the ideological belief that, in order to conserve and manage water properly, it is essential to put a price on what used to be a public good. In 1992, the UN adopted the Dublin Principles, declaring that putting a price on water and establishing a “participatory approach” – which is about involving users, planners and policy-makers at all levels – was the best way to reach a sustainable and equitable governance of water. The principles were quickly adopted by Brazil’s government, and implemented first in, you guessed it, São Paulo. The Dublin Principles call for the establishment of “basin committees”, formed of government, water companies, local residents and civil society. These committees are supposed to be responsible for deciding on water use in a particular watershed. Yet, 23 years after this mechanism was supposedly implemented by Law 7663 in São Paulo – and after 17 years of asimilar rule at the national level – we still do not know who participated in these committees. On paper these committees exist, but in practice they are not empowered by state structures. Dysfunctional governance in São Paulo state has left the part-privatised utility, Sabesp, to mainly follow the principles of the market and the interests of its private shareholders. This inevitably skews its strategy towards the short-term. When deciding whether to make the necessary investments to prepare for possible water shortages, Sabesp has had to choose whether to safeguard the public supply or increase the value of its shares. The company did invest US$4 billion from 2005-2013, but that is still not enough. Many of the necessary measures to prevent the current crisis – such as upgrading the Cantareira system – were not implemented because they would be unprofitable to Sabesp’s shareholders . The company’s lack of transparency since the crisis kicked off highlights its planning failure. For many months Sabesp denied that water was being rationed. Then state governor, Geraldo Alckmin, acknowledged that there was lack of water, but said they were “isolated and private” cases. Then a bonus offered to those who economised water in their daily use, later turned into a fine for those who “waste” water. The most essential resource of all has now become a struggle in São Paulo. Yet, ever deepening inequality has turned a water crisis into a social and economic crisis – communities on the periphery of the city and slums were inevitably the first to have their water rationed. Responsibility for this crisis lies with Sabesp and two decades of running water supply as a for-profit service. It is a failure of public-private partnership. As climate change and other environmental factors make water crises more likely, we better rethink the way water is managed worldwide.